The term reflux (also called gastro-oesophageal reflux or GOR) is just another name for spilling. This is when a baby's stomach contents pass up into their gullet (oesophagus) and into their mouth. Spilling is quite normal in babies, and is different to vomiting, when a baby empties their stomach forcefully. Why do some babies have problems with spilling? A baby's oesophagus (gullet) and stomach is not yet fully developed. In an adult, the stomach contents are kept in place by the lower oesophageal valve. 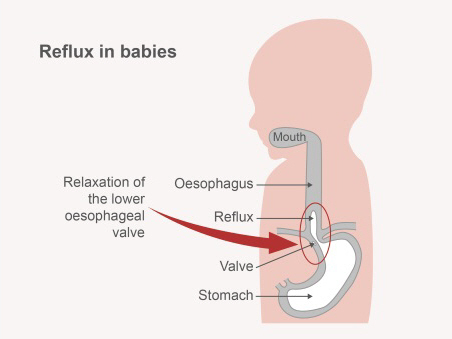 However, in babies, the lower oesophageal valve relaxes more often, so that stomach contents can come back up into the oesophagus (gullet) more easily. This means that spilling is common in babies. About 40% of all healthy babies spill at least once a day. This is normal. If your baby spills, there is no need to be worried as long as they are growing well. Spilling peaks at 4 months of age and has usually settled down by 12 months. Tests and medications are not normally needed for babies who have spilling. In fact, medications can be harmful for young babies. Some people talk about "silent reflux". This is not a medical term and it's best not to use it. It refers to a normal baby who is unsettled and crying, but does not have spilling. What can I do if my baby spills? If your baby spills a lot, there are some things you can do to help. Dress or change your baby before feeds when their stomach is not full. Wind your baby several times during feeds. Use a towel to cover yourself and to put under your baby, and use large bibs to catch the spills. Keep your baby upright after a feed for a short time. Try propping up the head of the bassinet or cot. Make up the bed with your baby's feet at the bottom, so that they cannot slide under the blankets. Make sure your baby always sleeps in a safe position on their back, to prevent sudden unexpected death in infants (SUDI, also called SIDs). Babies should not sleep on their tummies or on their sides. In most cases if your baby is growing well there is no reason to worry about spilling. However, some babies who spill, and who are also not growing, feeding, or sleeping well can have something called GORD (gastro-oesophageal reflux disease). Most babies with GORD do not need medicines, but babies who are not growing well may need to have some tests. If you are worried about your baby's growth, feeding, or sleeping, take them to see a doctor for a check-up. are crying inconsolably and are irritable. Although, cow's milk protein allergy (often called a dairy allergy) has been known to cause spilling and GORD, it's not usually necessary to try changing formulas or eliminating dairy products from your diet. Talk to your health professional before making any changes. If my baby is unsettled, does this mean they have GORD? Most unsettled babies who spill do not have GORD. Most babies with irritability do not have spilling or GORD. GORD may cause irritability in only a small number of babies, however these babies will have other concerning symptoms that help your doctor diagnose GORD. Medicines such as omeprazole or ranitidine have been given in the past to infants who were unsettled and thought to have GORD. We now know that these medicines do not work for unsettled babies, and may even cause an increased risk of serious illnesses such as pneumonia and gastroenteritis.